Why do Sika Deer Head to the Alpine Region? The attractions of the Southern Alps include the dense evergreen coniferous forests where the primal breath can be felt, and the “alpine meadows” full of Trollius japonicas blooming, which has been likened to an earthly paradise. 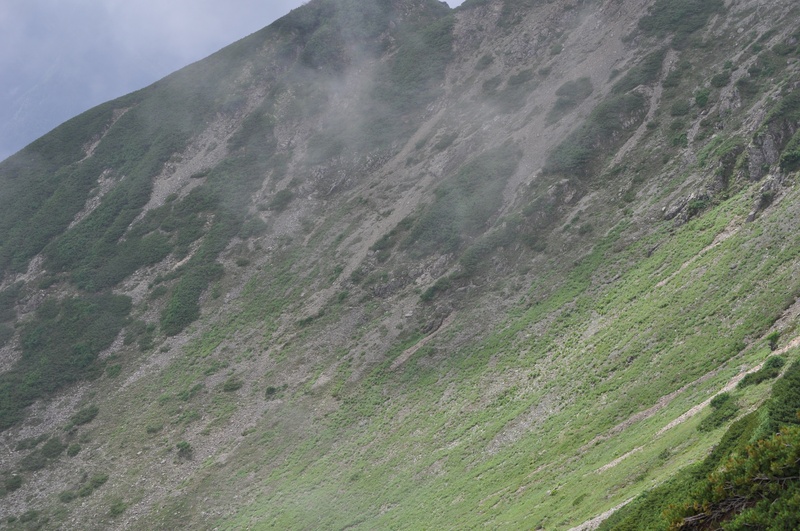 In recent years the sika deer (Cervus ｎippon) have penetrated into this alpine region, and with them grazing the rare Alpine plant community, there is a danger of that these “alpine meadows”, a symbol of the rich mountain environment, will disappear. 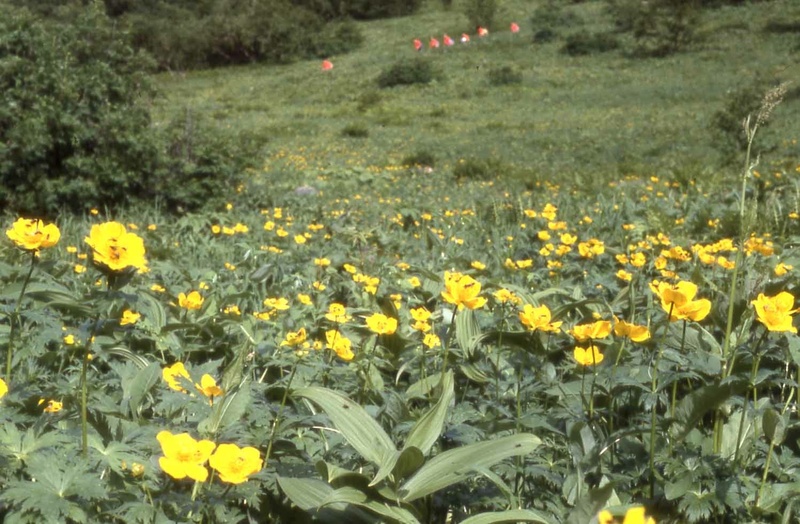 During only 10 years since 2000, the brightness of the alpine meadows has been lost. From a questionnaire survey done in 1984, it was found that there were virtually no sika deer breeding in the northern part of Southern Alps. From the 1990s the sika deer quietly started to use the evergreen coniferous forests of Veitch's silver fir and Abies mariesii in the subalpine region, as well as the Erman's Birch forests and herbaceous communities. From the early 2000s the sika deer encroached further into the subalpine region and settled there, and in about 10 years the brightness of the “alpine meadows” has disappeared. It was generally considered that the alpine environment with many steep slopes was harsh environment for the sika deer to breed. However the hooves of sika deer living in steep slopes have worn down, and are like the hooves of Serow that perch on cliffs. Why have the sika deer encroached into the alpine region where the breeding conditions are considered to be severe? Where does sika deer that appear in the alps during summer come from and how did they get there? Why do sika deer come to the alps? 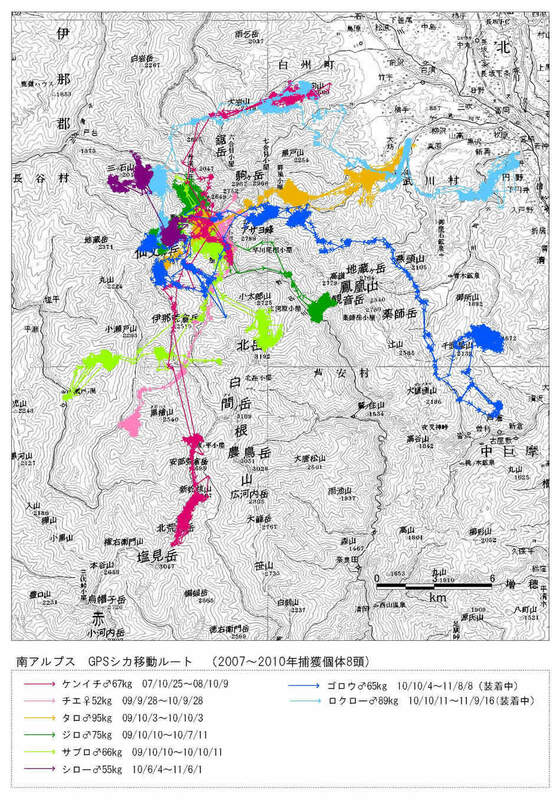 Research for movement of Sika deer trucked by GPS telemetory in the North of the Southern Japan Alps. The movement in spring from their winter habitat at elevations below 1,800 m to their summer habitat has been observed in June. This movement occurred over a long period of time, and was great both in terms of difference in elevation and in distance. 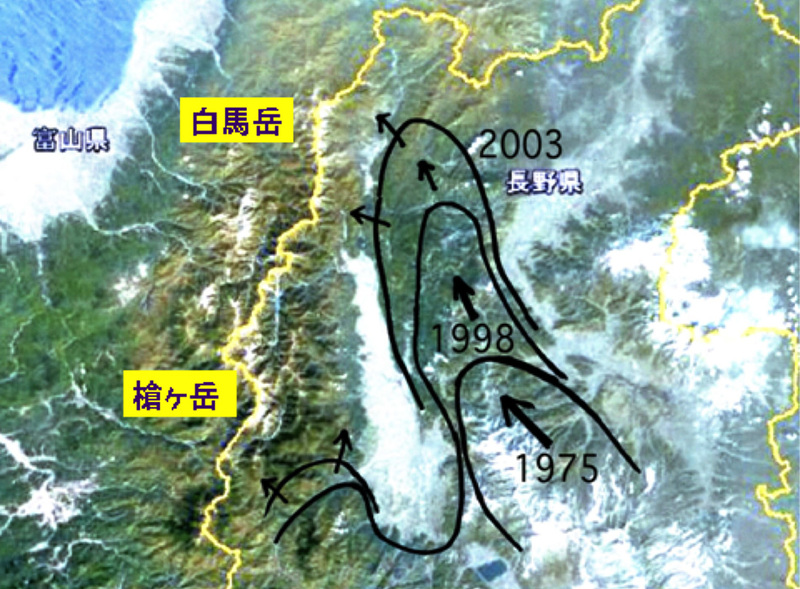 This spring movement was observed along with the rise of foliation front from the upper parts of the subalpine region to the alpine region, when plants start to grow and green shoots extend from the lower elevation towards the higher elevation. In summer time, from early June until early October, the sika deer made use of the alpine environment, such as the alpine meadows, from the upper subalpine region to the alpine region. 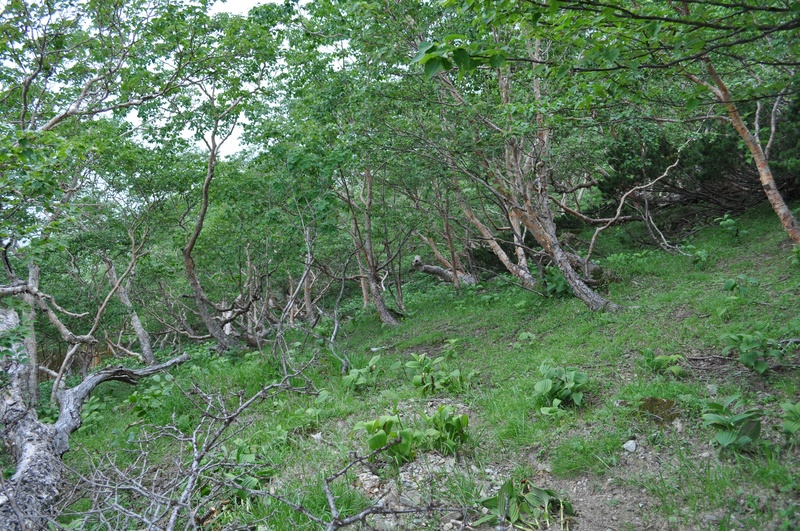 During summer, it was found from the positions of the individual tracks and the vegetation in the Mt.Senjogatake region that the locations where the sika deer grazed excessively of the rare alpine vegetation communities were Erman's Birch forests and herbaceous species of altherbosa (alpine plant communities) of the upper subalpine zone. After reaching the main ridge lines which is the environment they use in summer, no large movements were found. Their use of the surrounding alpine environment continued until September. The individual’s fixed positions concentrated in Erman's Birch forests and altherbosa. The sika deer continuously keep on grazing the alpine meadows throughout the summer. 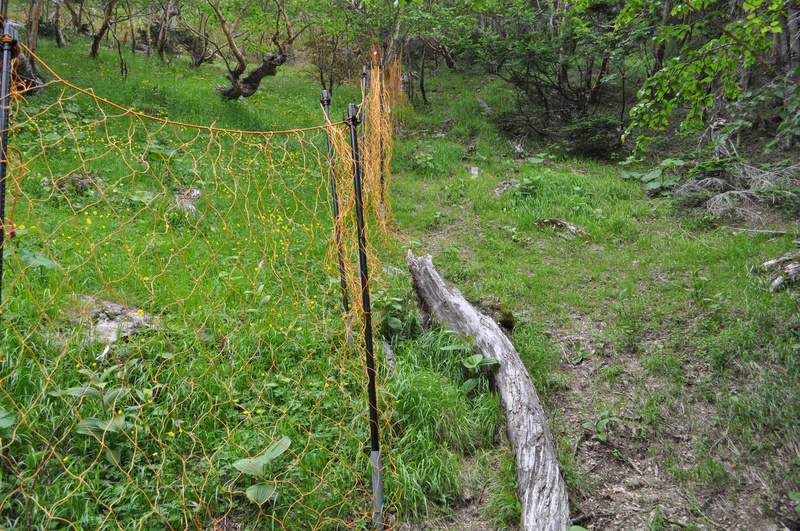 Protective fence installed in Mt.Senjogatake and damaged fances during winter are repaired in early June. Before the repair Sika deer already reach the surrounding area and use the areas inside and outside the protective fence. However, after the repair they cannot use the area inside the fence. Comparing photographs inside and outside the fence after only 2 weeks it can be seen that flowers are starting to bloom on the inside of the protective fence, while on the outside none can be seen. This shows how great the effect of the protective fence is. 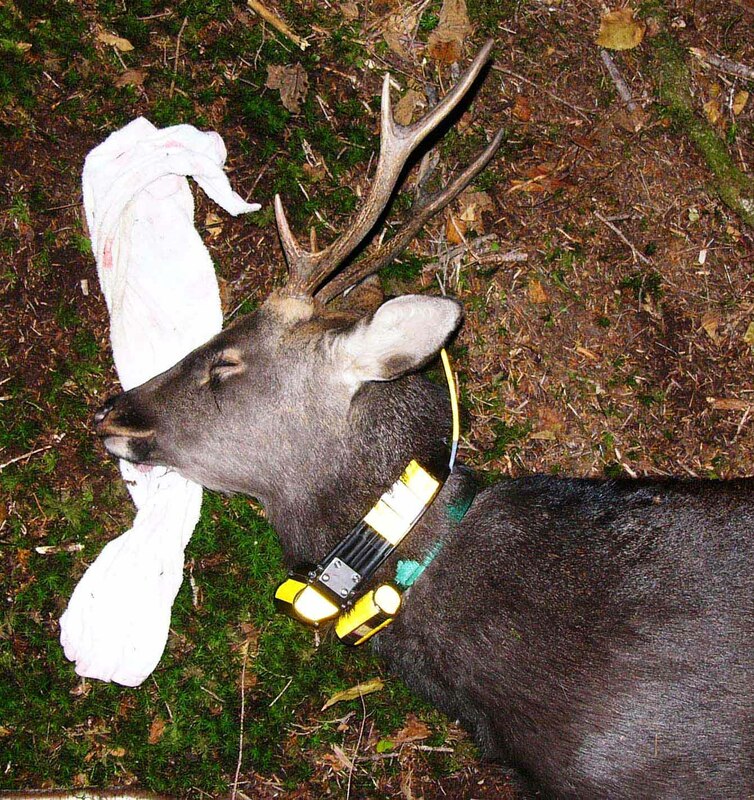 It also shows how severe the browsing pressure of the sika deer is. It is considered that the movement to their summer habitat is caused as a result of movement to areas with more favorable grazing conditions. The expansion of the distribution of the sika deer is the result of movement from regions where the breeding density is high and the grazing conditions have become poor to regions where the breeding density is low and the browsing pressure is less. 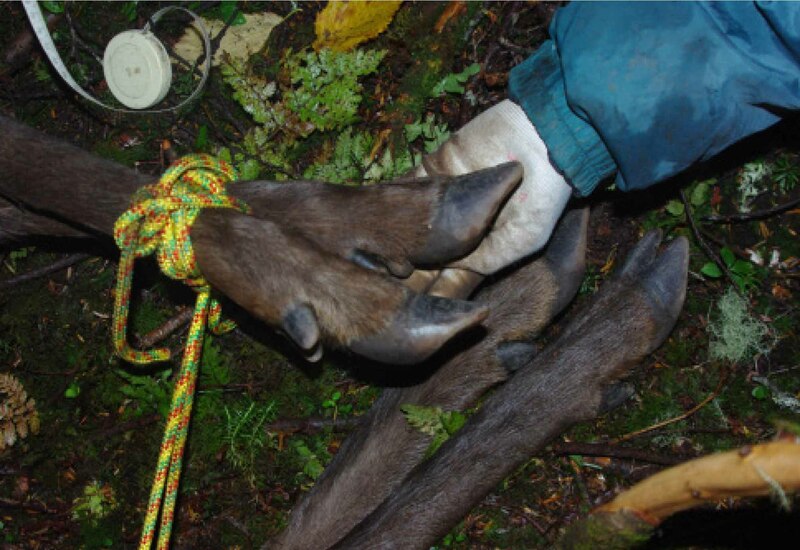 It is considered that as a result of repeated movements constantly seeking locations with good grazing conditions favorable to birth and raising young in the case of females and for development of physical size in the case of males, they have encroached into the upper parts of the subalpine region. It is considered that this has produced the pressure in expansion of distribution to emerge from the foot of the mountains of the Southern Alps where the breeding density of the sika deer is now high, towards the alpine region. The sika deer are now heading towards the Northern Alps. Ahead lays Mt. 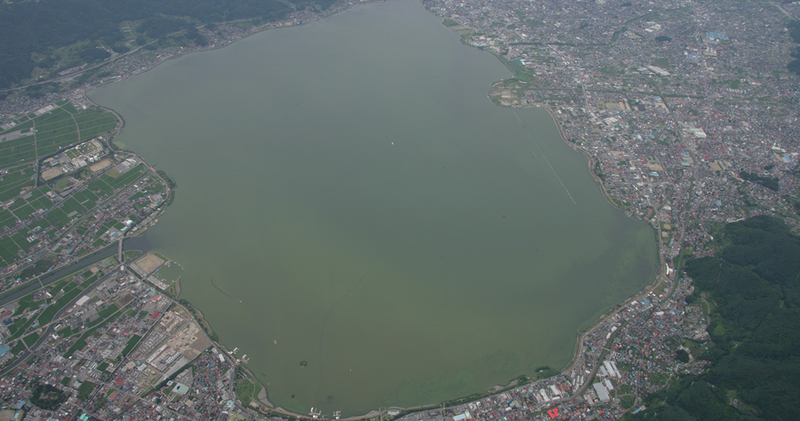 Shiroumadake and other places with plentiful flowers of rich diversity. The sika deer have come through the dangers of extinction since the stone age and barely survived. They are tough creature that survived disturbances from humans nearby. In the future we must continue to live with these sturdy neighbors. We must utilize the experience from the past in the Southern Alps so that it should not repeat in the future. It is necessary that we face the question of what must be done in order that what has occurred in the Southern Alps will not be repeated in the Northern Alps and elsewhere.